Carleton Watkins (1829–1916) was the consummate photographer of the American West. 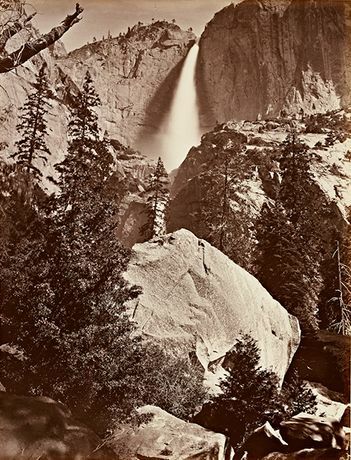 Born in Oneonta, New York, he moved to California in 1849, taught himself the new medium of photography, and established his reputation in 1861 with an astonishing series of views of Yosemite Valley. It was partly due to the artistry and rugged beauty of these photographs that President Lincoln signed a bill on June 30, 1864, declaring the valley inviolate and initiating the blueprint for the nation's National Park System. In the middle of the brutal Civil War and its destruction of man and land, Lincoln saw the preservation of a small but extraordinary piece of America's wilderness as a progressive goal to share with the republic. Watkins was a virtuoso practitioner of the difficult wet-collodion process, and the remarkable clarity of his "mammoth" prints (18 by 22 inches) was unmatched. He rendered with exquisite finesse the vastness and grandeur of Yosemite's glacial valleys, dramatic waterfalls, massive rock faces, and majestic trees. Watkins produced this work wrangling a dozen or more mules carrying roughly two thousand pounds of equipment, including his oversize camera, large glass plates, and flammable chemicals. It is in itself a miracle that any photographs survived these travails. The exhibition includes a suite of views made by Watkins during his first encounter with the sublime topography of Yosemite in 1861 as well as a larger group of studies from his later visits to the valley in 1865 and 1866 while working for the California State Geological Survey. It features thirty-six photographs that helped advance the notion that Yosemite was a Pacific paradise, a bit of Eden in North America.